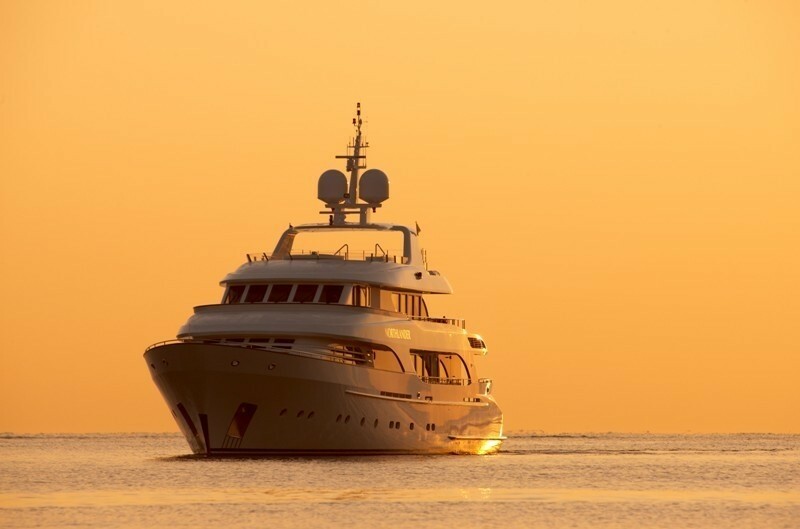 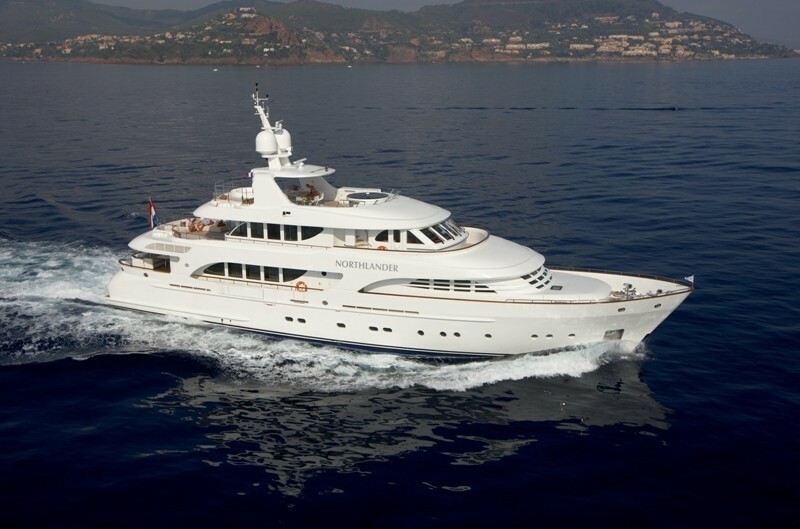 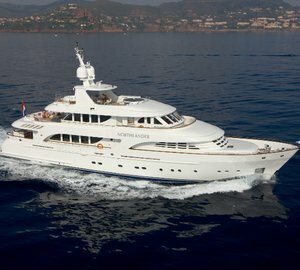 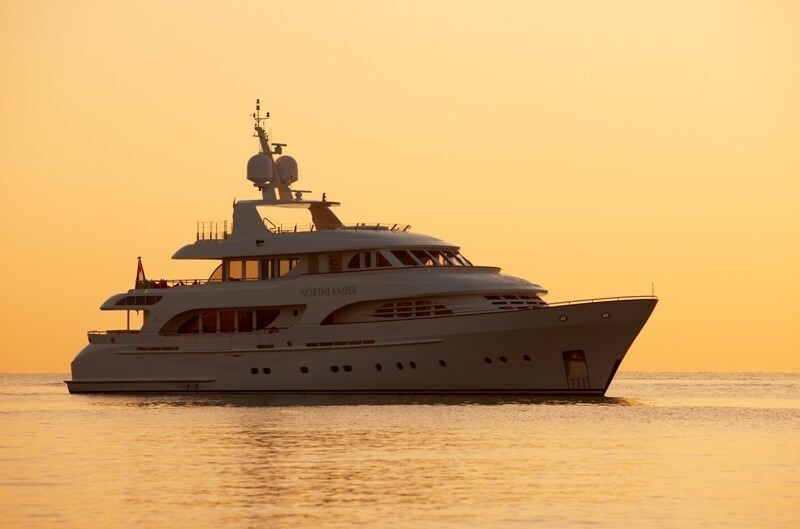 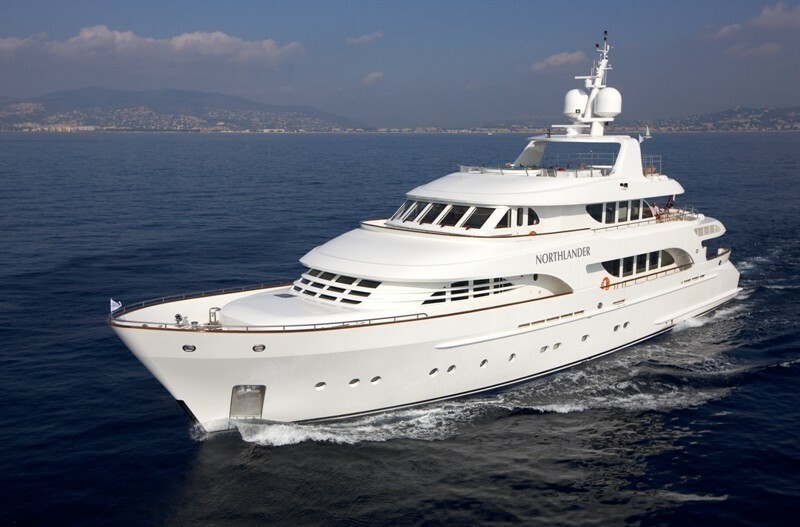 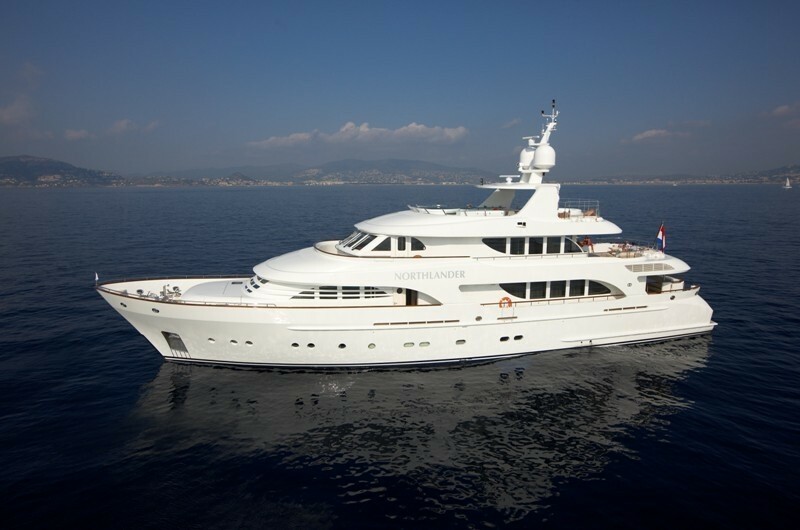 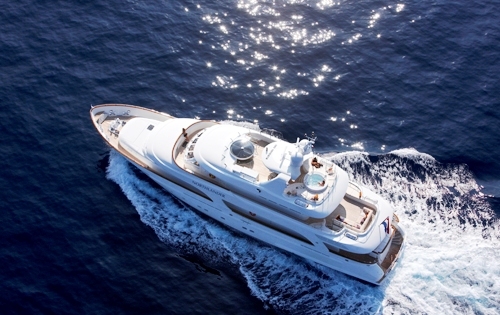 Luxury motor yacht NORTHLANDER is a 38.16m (125' 2") Moonen 124 Superyacht. 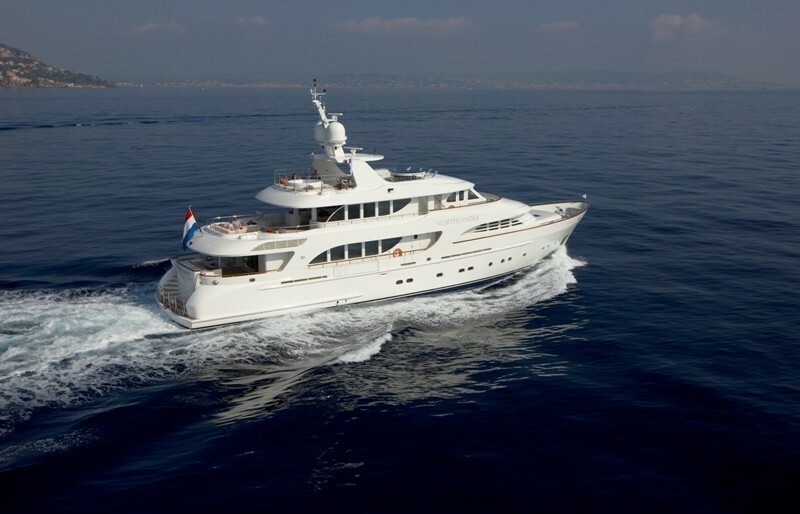 The Moonen 124 NORTHLANDER was shaped by René van der Velden Yacht Design over a hullform by Stolk Marimecs naval architects. 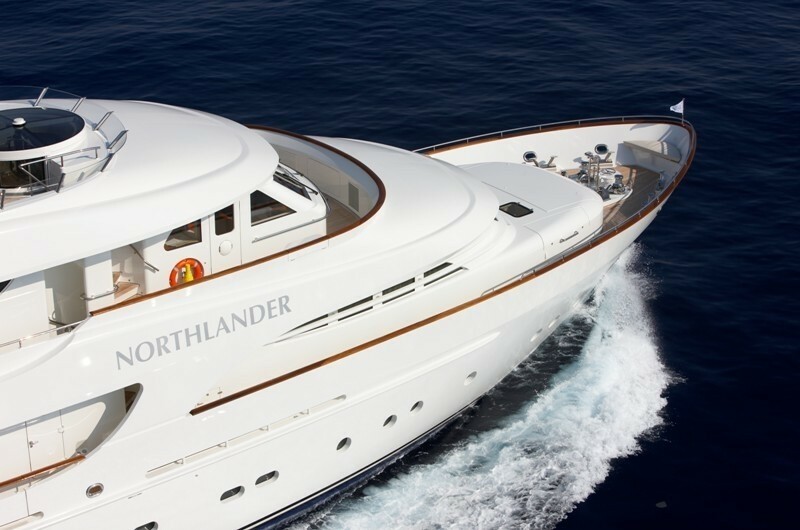 Motor yacht NORTHLANDER was launched in 2010 and can accommodate up to 8 guests for luxury yacht charters in the Western Mediterranean. 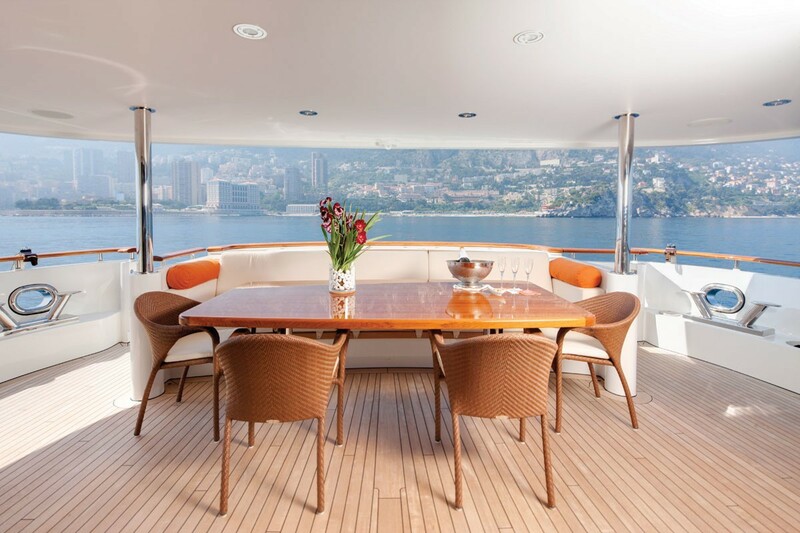 The Moonen 124 is a sleek- lined motor yacht following the existing Moonen form with a gracefully balanced bow and stern, attractive fashion plates, and a low superstructure profile. 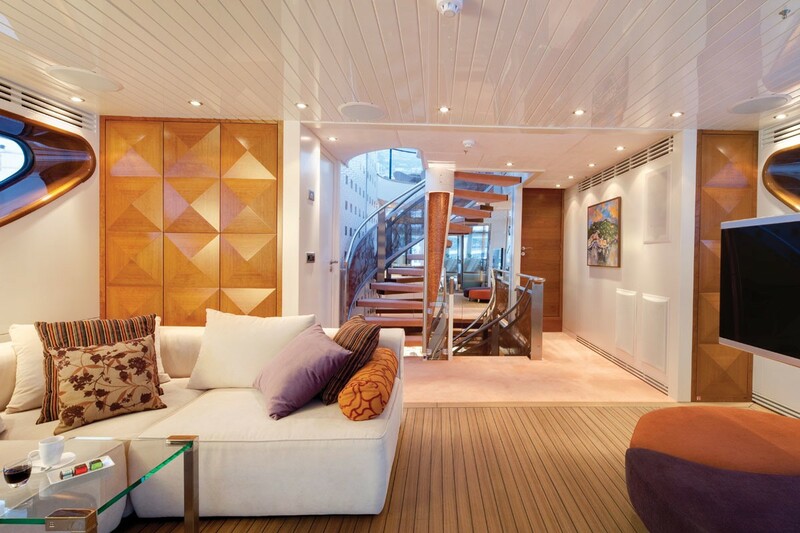 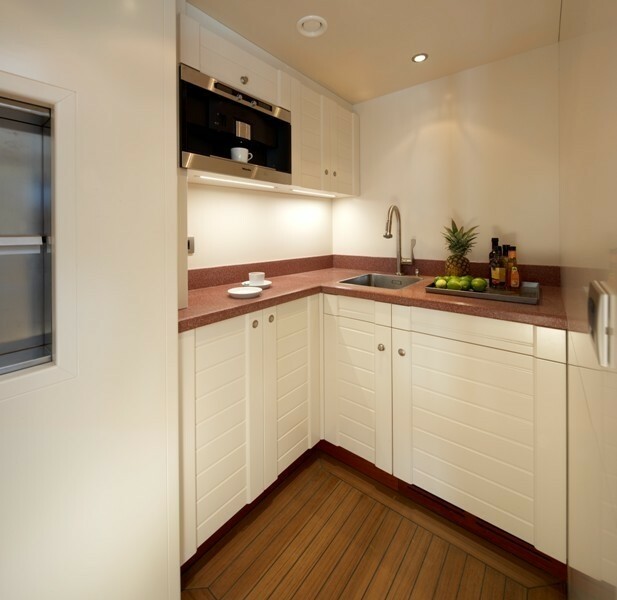 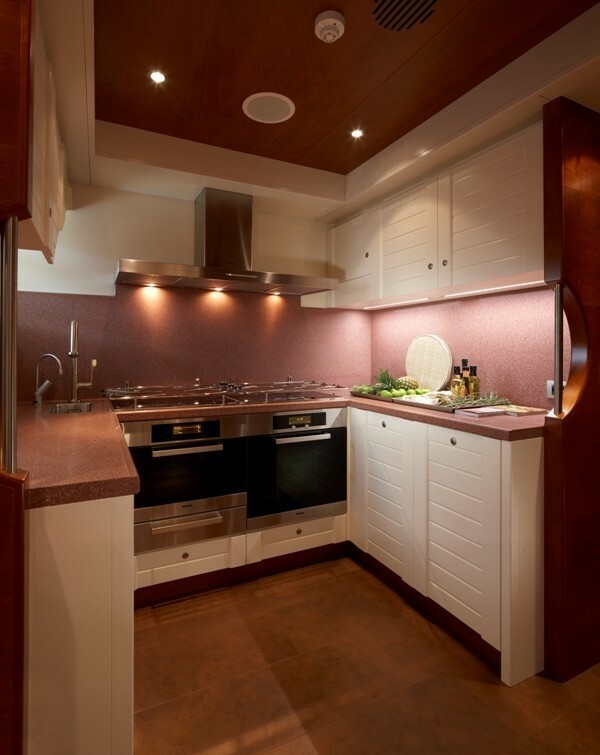 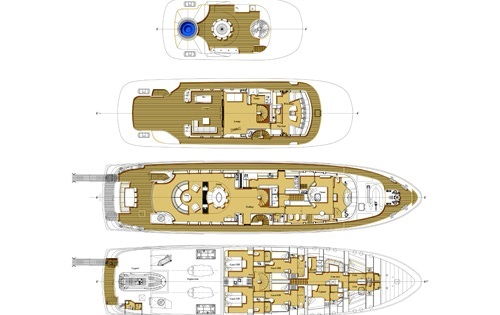 The Moonen 124 NORTHLANDER has a 4 deck layout with a central atrium and spiral staircase. 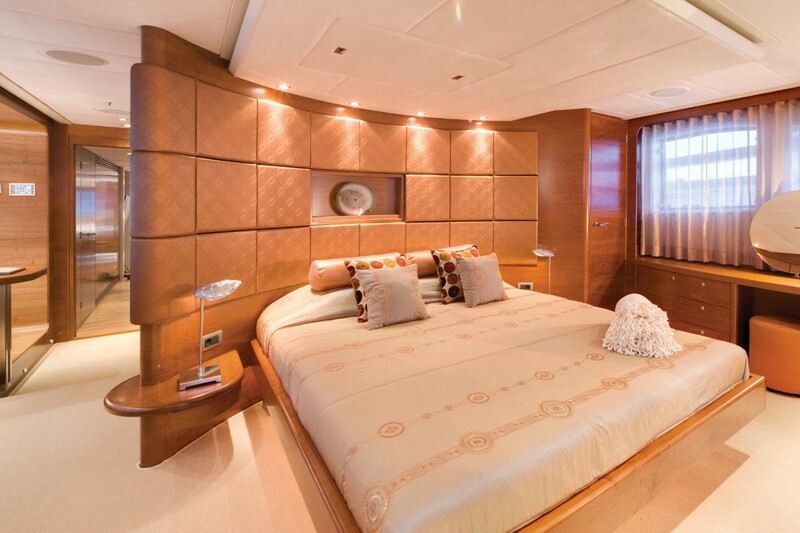 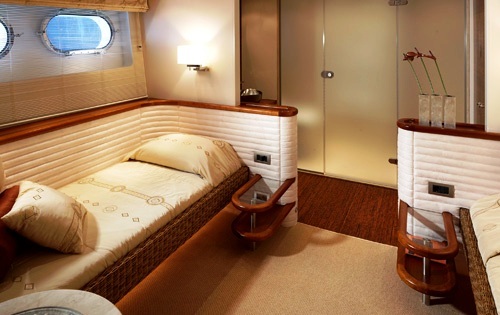 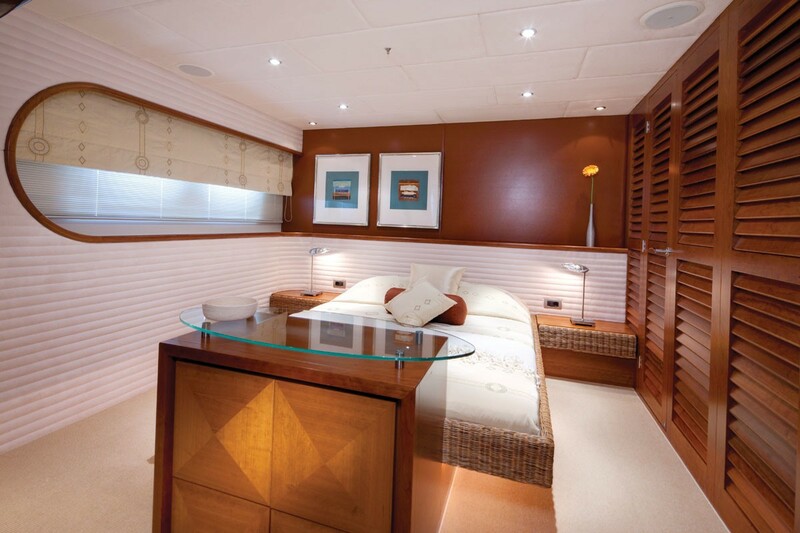 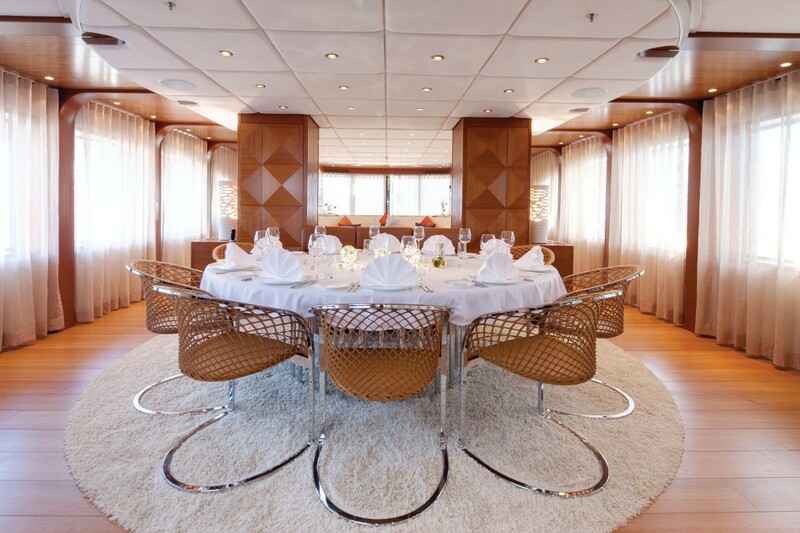 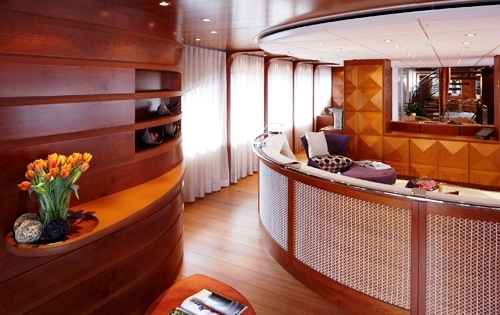 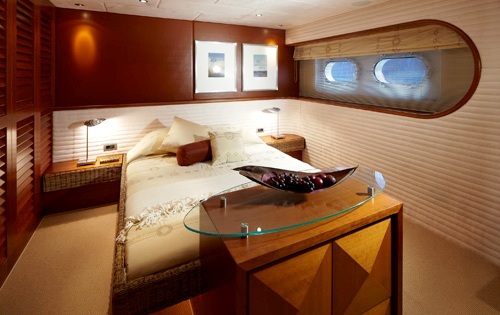 Her layout features a main-deck master suite forward with the remaining cabins including 2 double and 2 twin guest staterooms on the lower deck accessed via the central staircase. 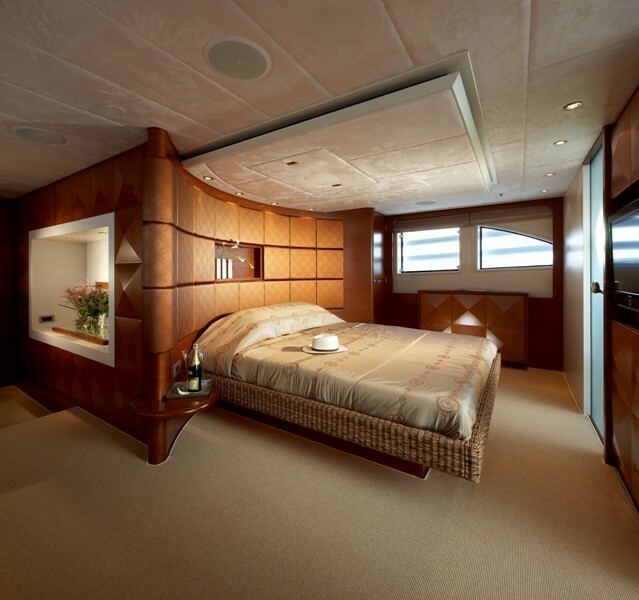 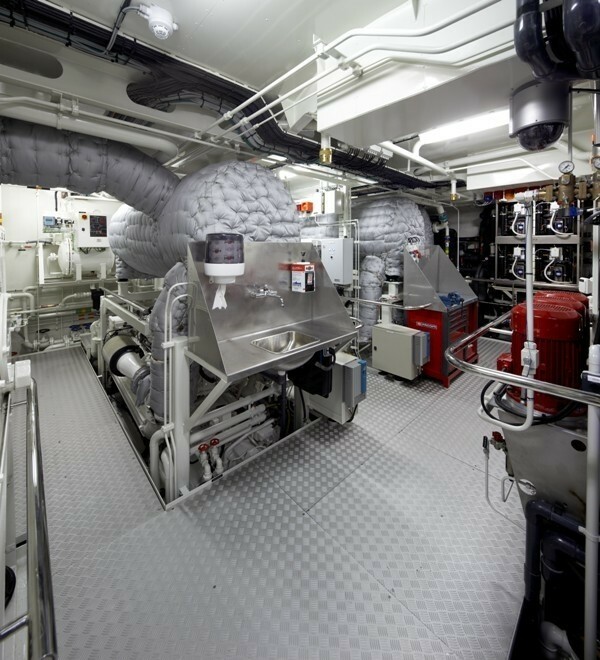 Additional features include a large sun deck with a Spa Pool and wet bar, a rescue boat stowed on the main deck forward, and conning from the wheelhouse or bridge wings on the upper deck. 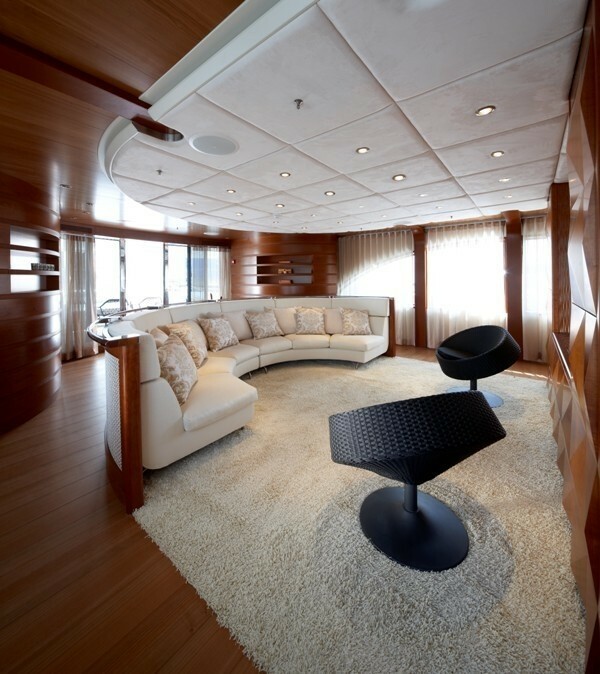 The interior of the Moonen 124 NORTHLANDER was designed by Art-Line Interior Design, which made full use of the volume featuring “fusion” styling of western cherry joinery “spiced” by Oriental details including woven bamboo, leather, wooden floors, tropical shutters, and lots of loose lounging. 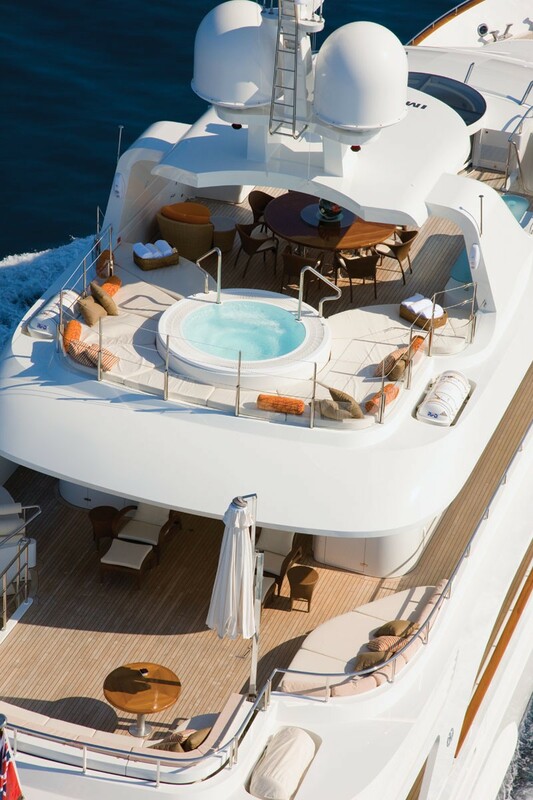 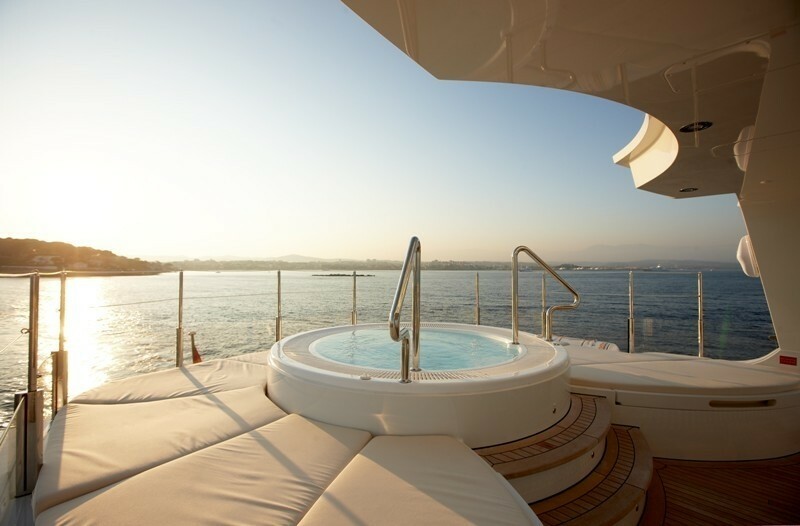 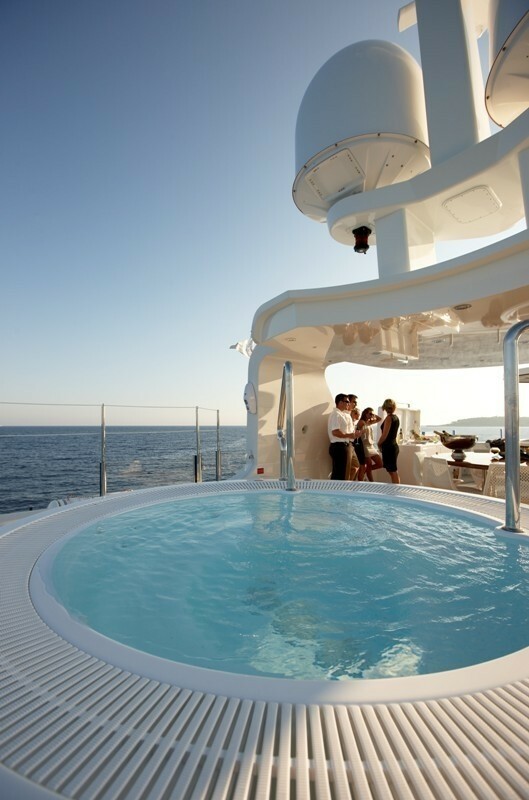 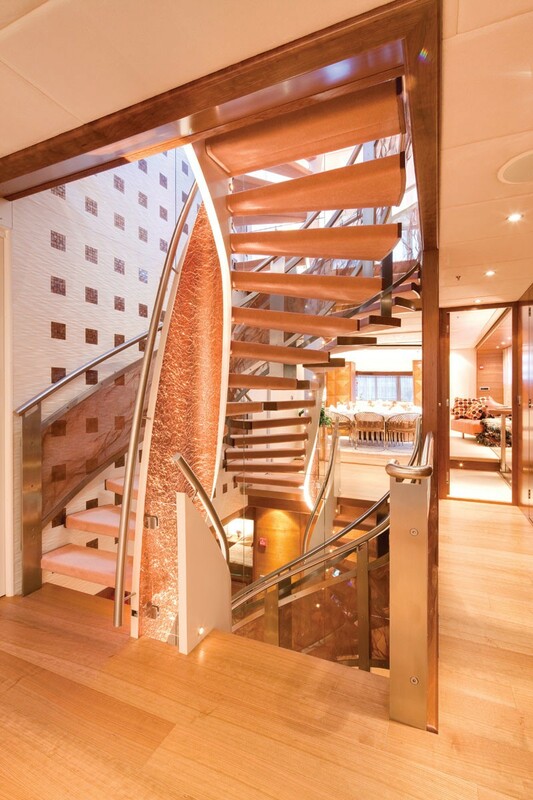 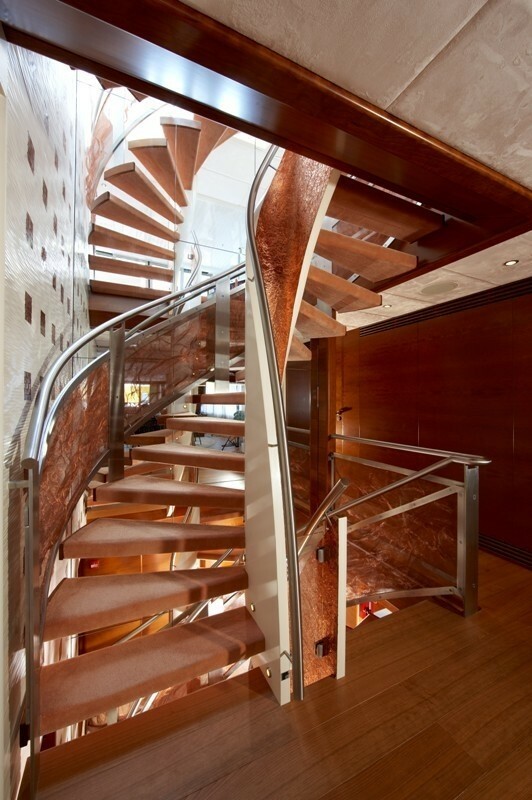 Luxury motor yacht NORTHLANDER’s central feature, literally, is its central staircase running from the lower accommodations deck to the sun deck. 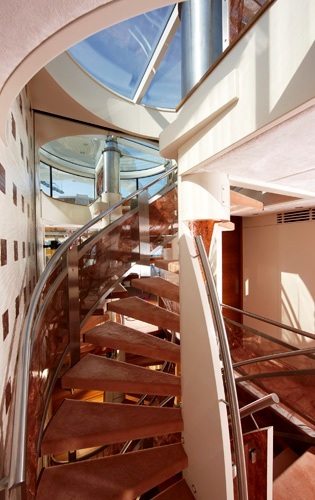 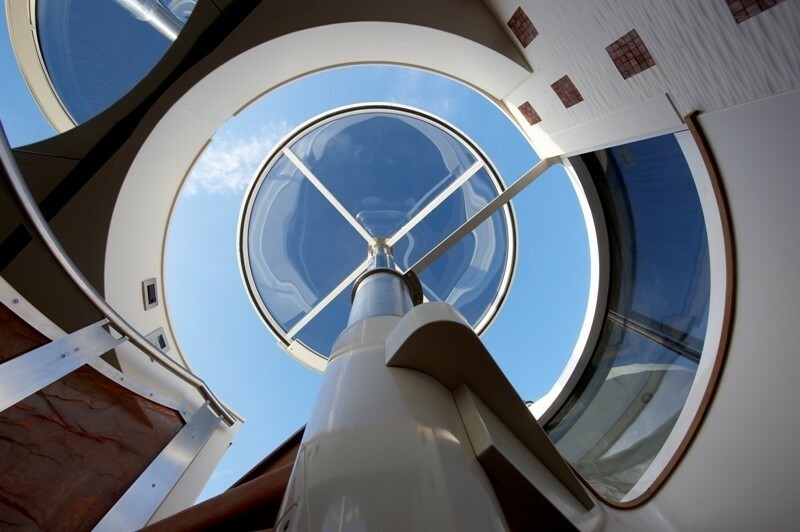 It is encompassed by a mirrored atrium, and topped by an opening skylight that gives access to the sun deck. 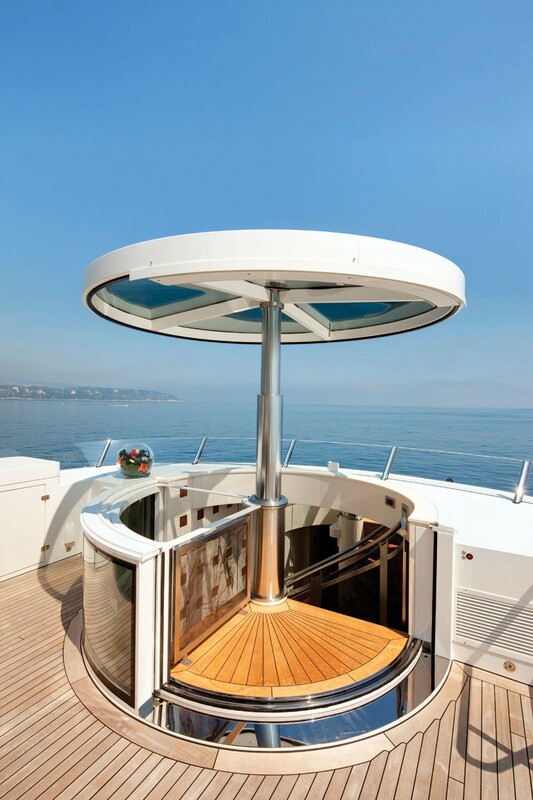 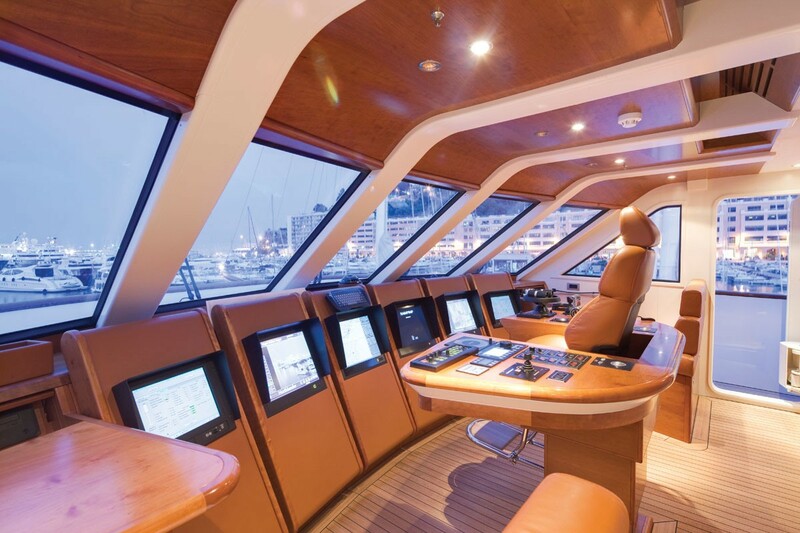 (see photos) This allows a column of daylight to fill the yacht’s heart and provides natural light to the main and bridge deck saloons that are already surrounded by windows and doors on three sides. 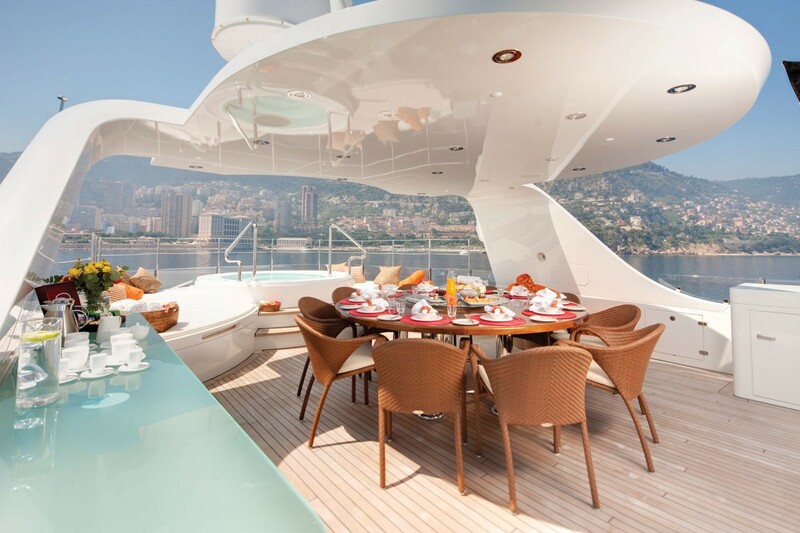 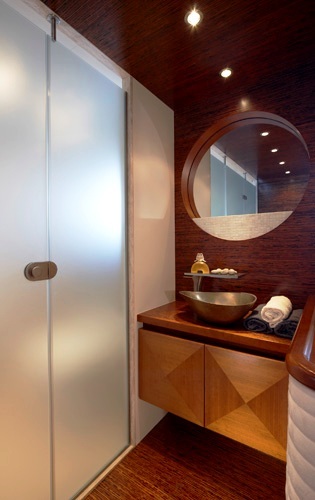 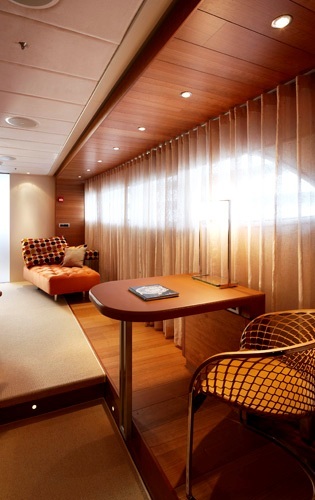 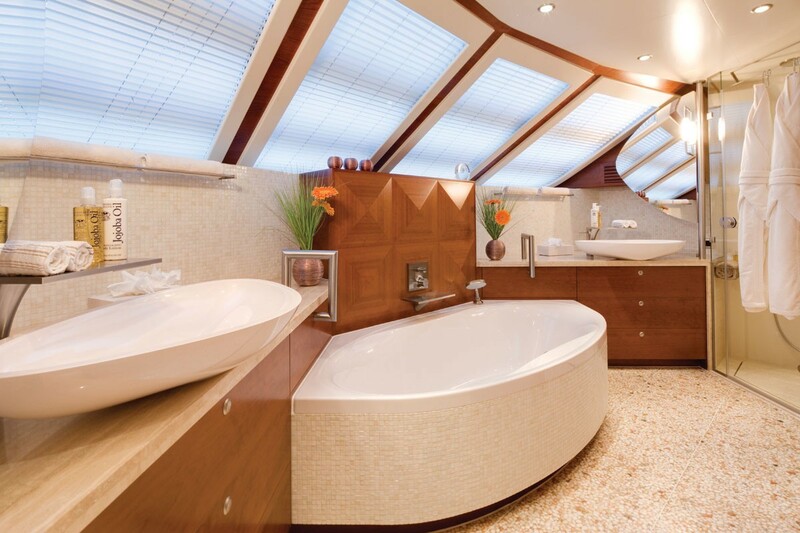 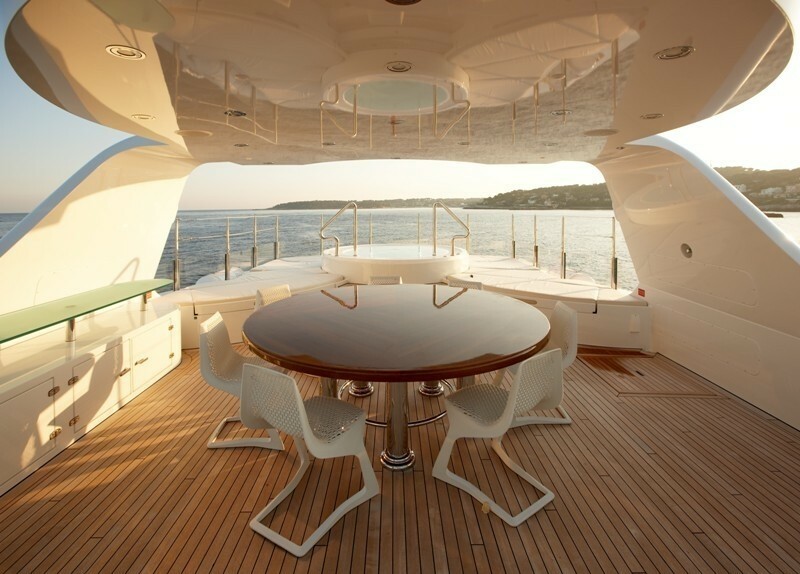 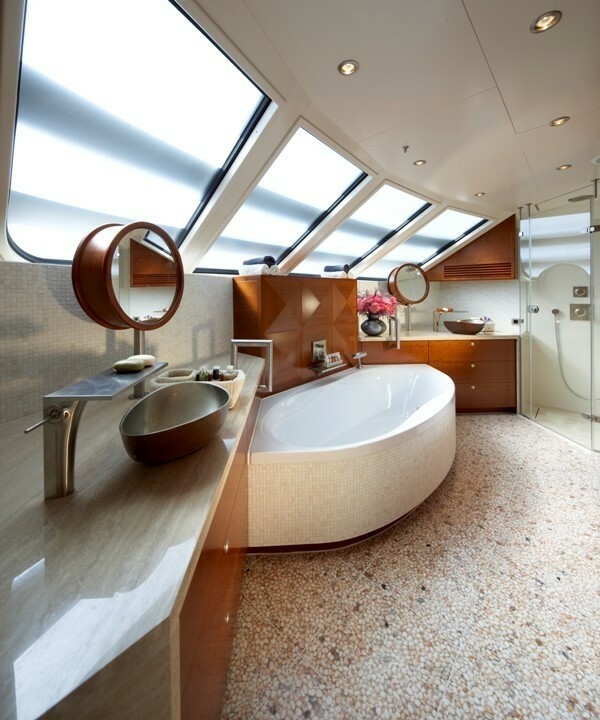 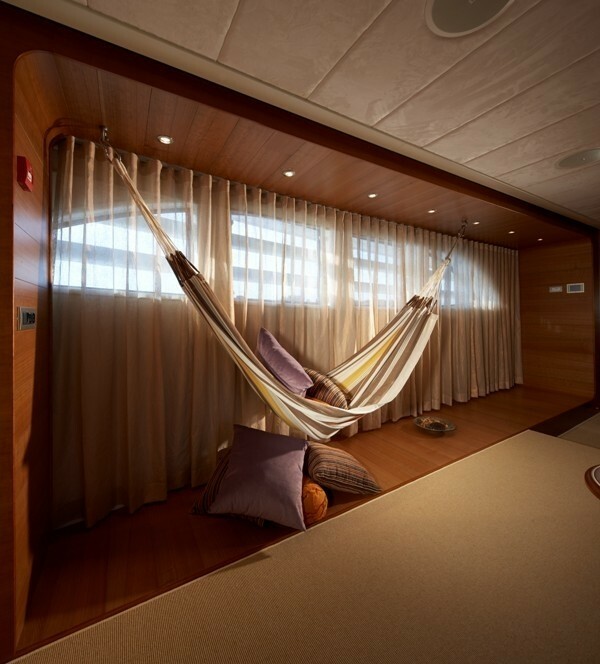 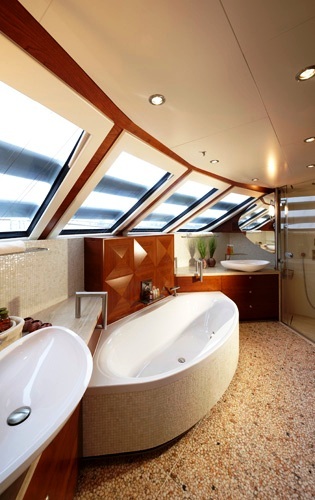 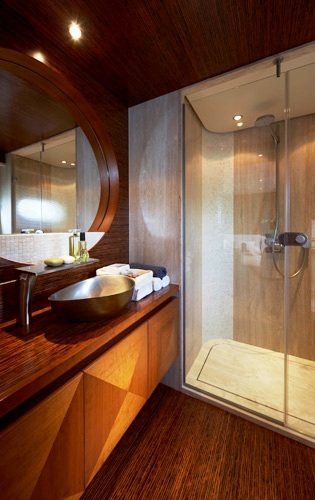 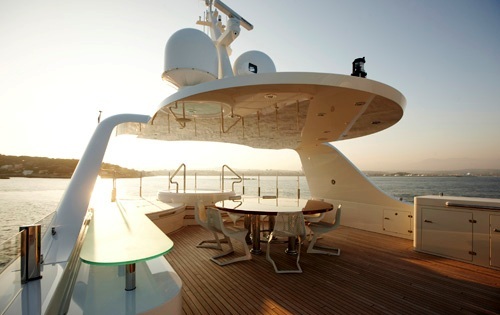 Having natural light available from a 4th side as well is a rare feature in any yacht. 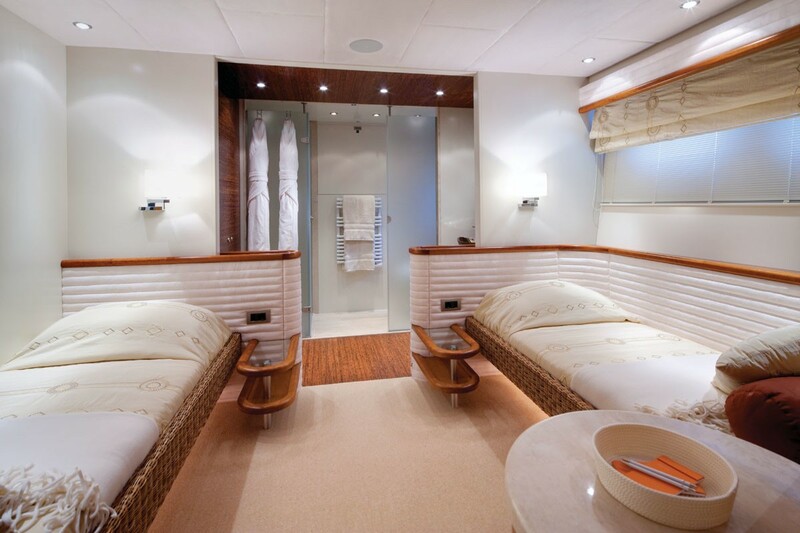 Superyacht NORTHLANDER’s main saloon is a “soft island retreat” with dining and lounging separated by a bold rectangular arch. 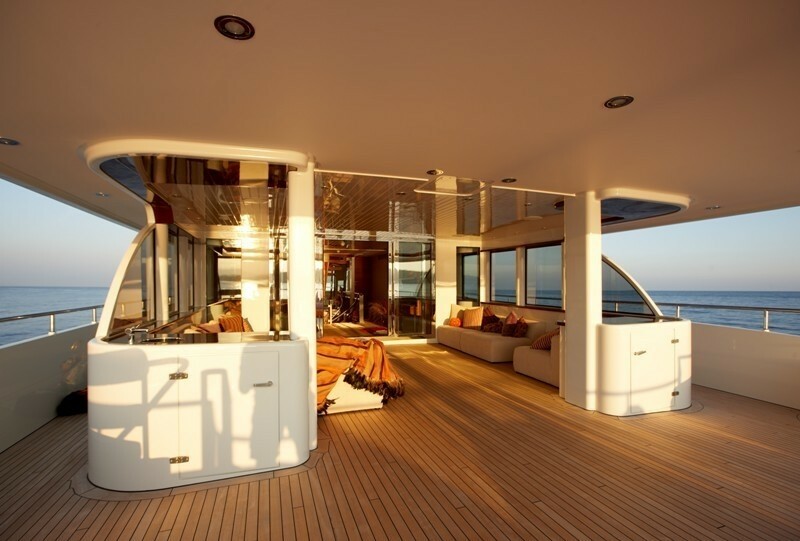 The indoor space is surrounded by wooden side decks under full-height windows that, again, maximize natural light. 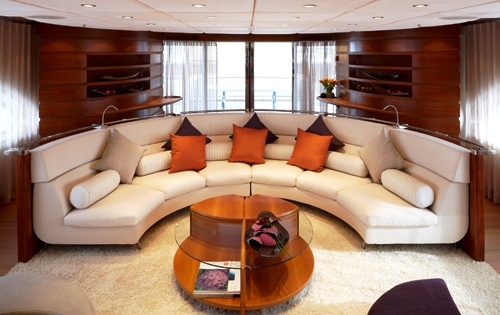 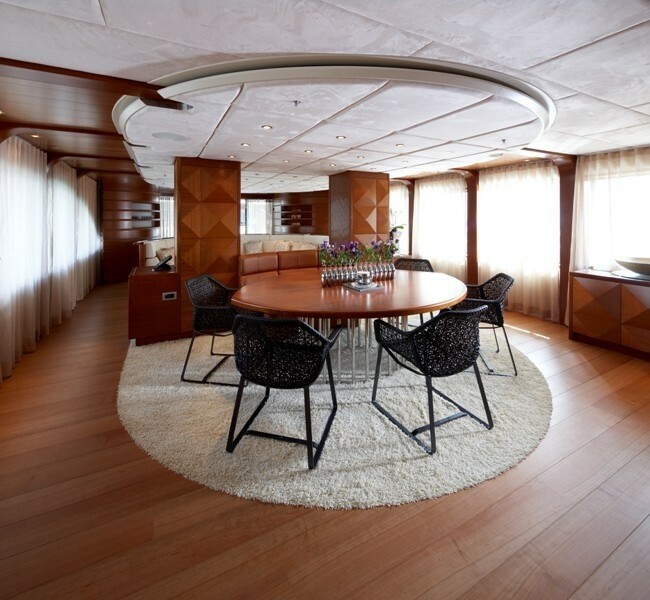 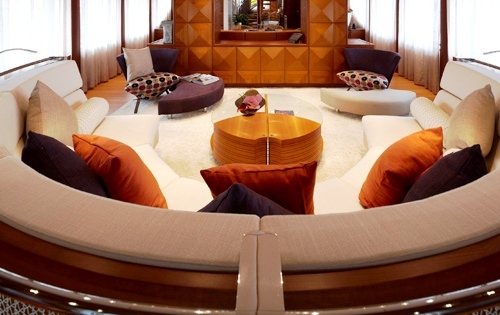 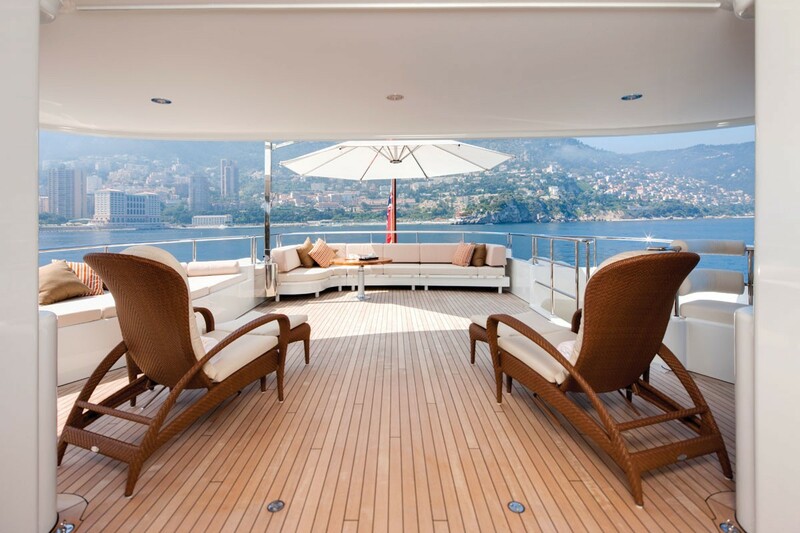 M/Y NORTHLANDER’s bridge-deck saloon has been uniquely configured as an extension of the large outdoor upper deck lounge to emphasize outdoor living. 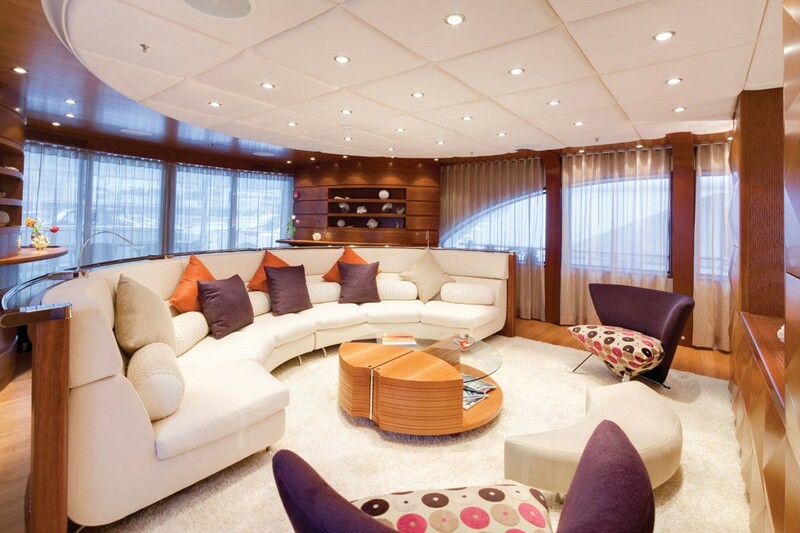 The bridge deck salon features bright sunny colors and decorative pillows set off by Moonen’s carefully executed joinery. 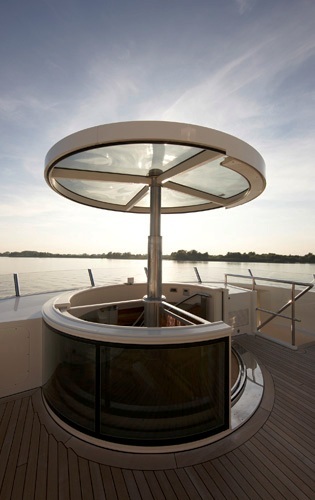 NORTHLANDER’s bridge is also unique, based on ergonomic principles. 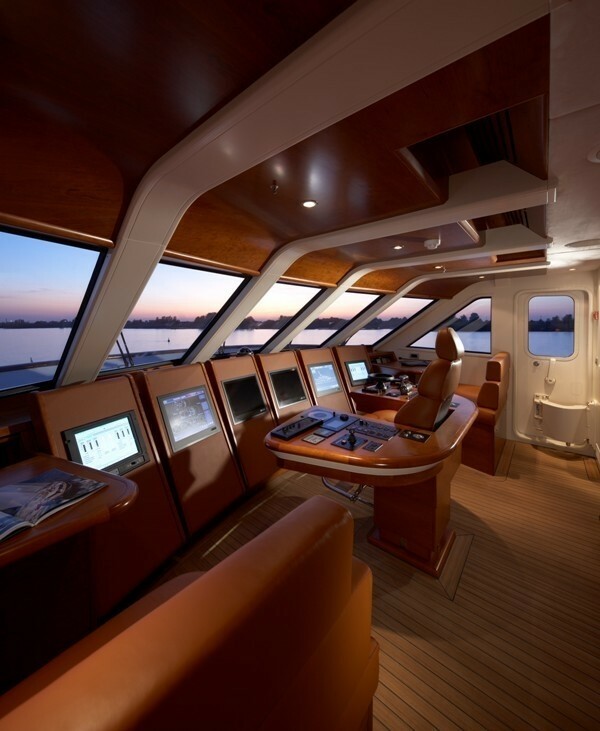 The display screens are set for easy reading, and manual controls are in easy arms’ reach of an operator centrally seated in the height-adjustable chair. 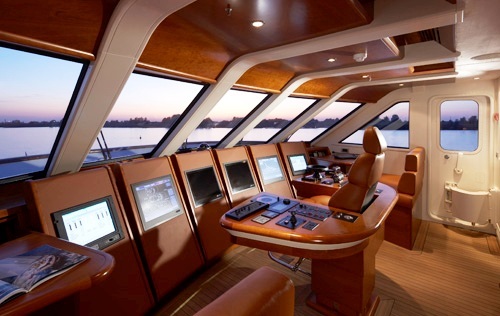 Observations settees enable guests to watch the Captain at work. 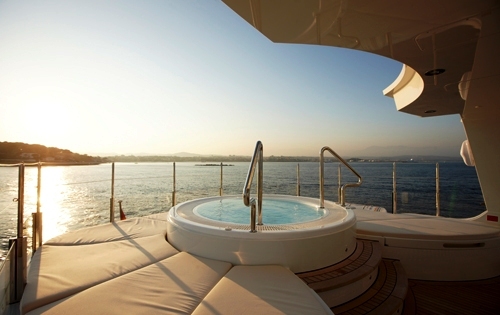 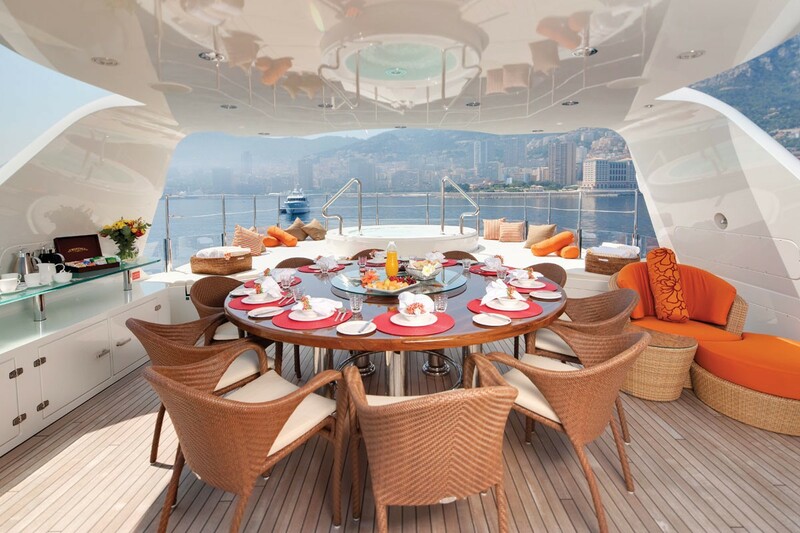 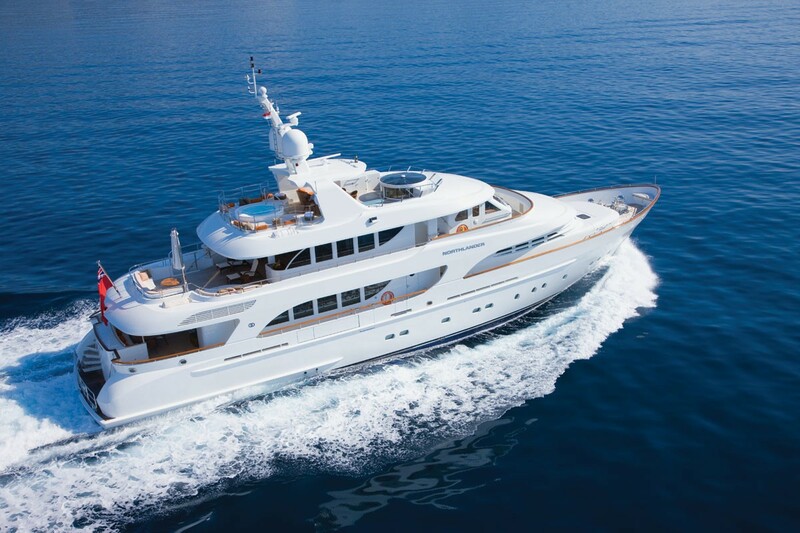 Charter yacht NORTHLANDER has a crew of 6 and charters in the Western Med and Northern Europe. 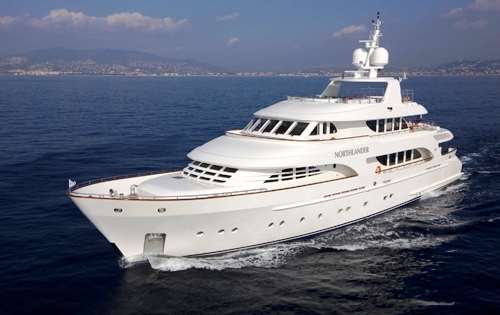 NORTHLANDER has a cruising speed of 11 knots with a top speed on 14.5knots. 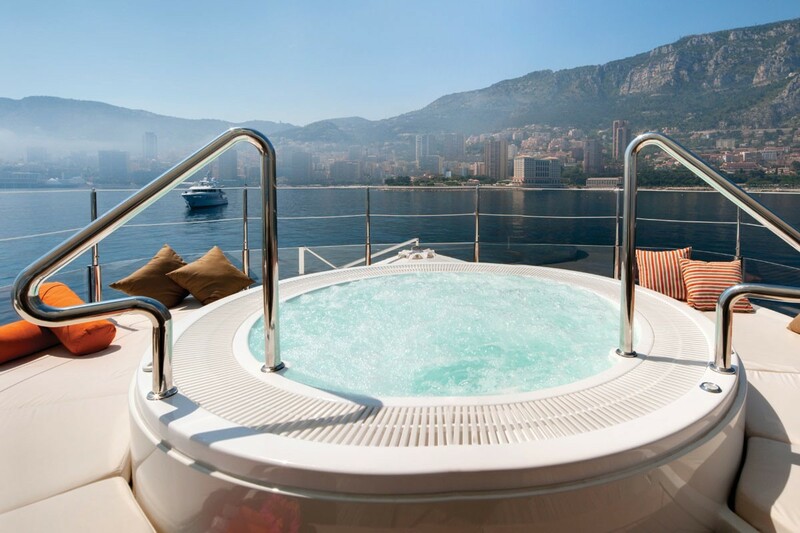 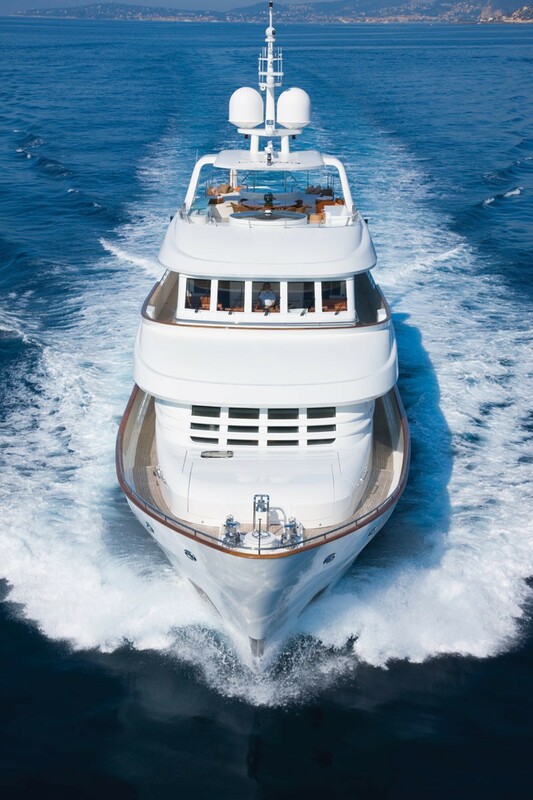 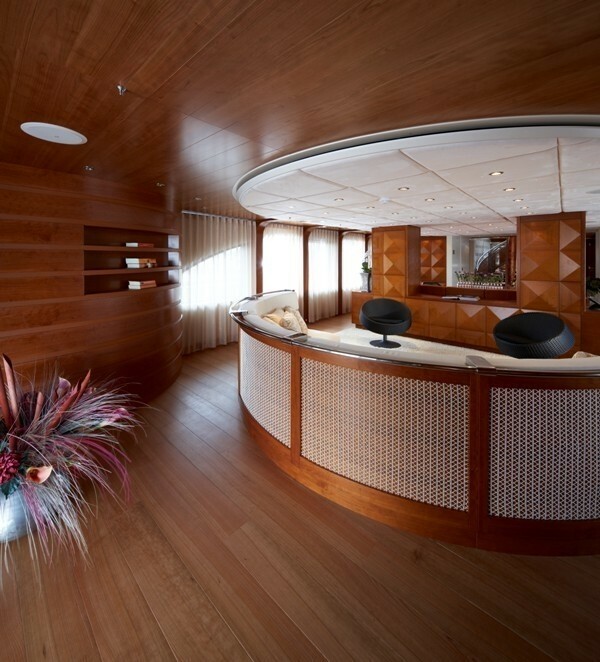 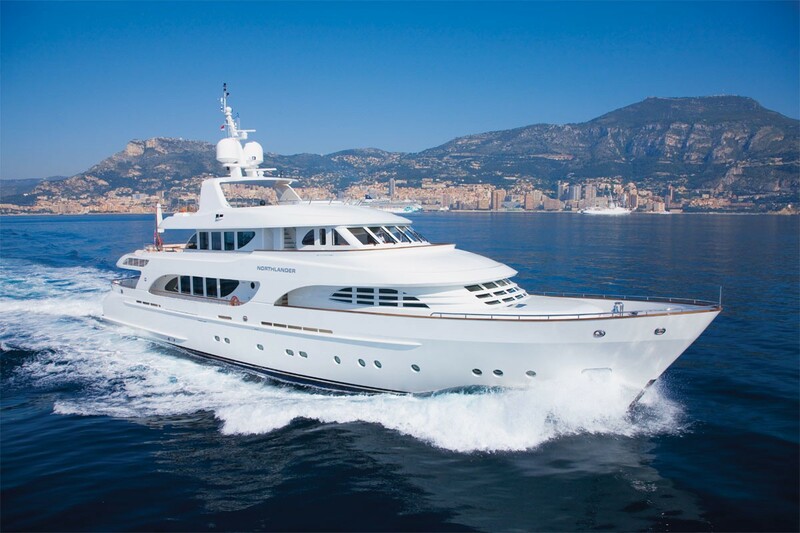 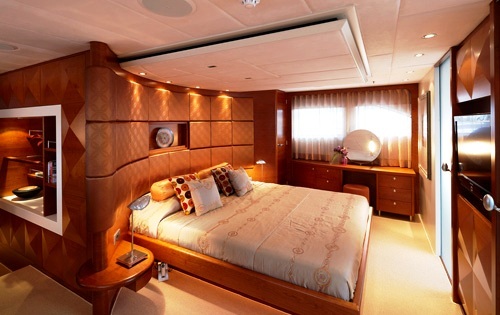 Luxury Moonen motor yacht NORTHLANDER can accommodate up to 8 guests in 4 staterooms including a master suite located on the main deck and 2 double and 2 twin guest staterooms located on the lower deck centred on the atrium and stairs. 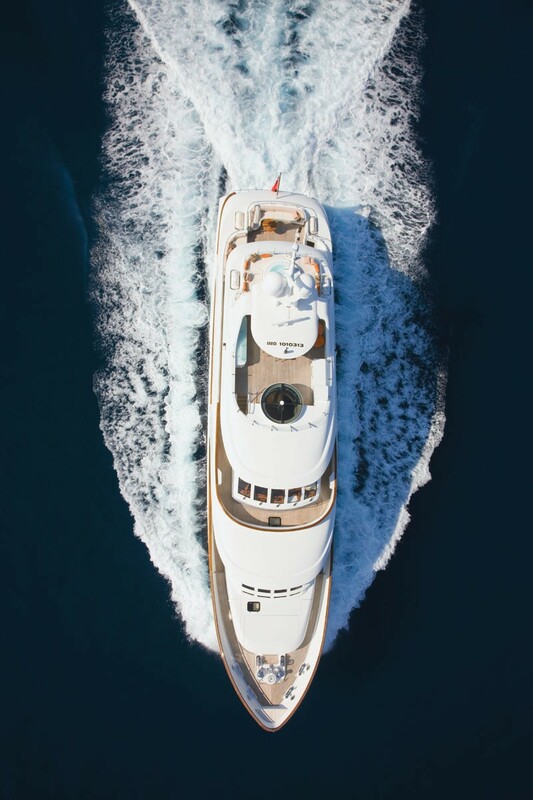 Motor yacht NORTHLANDER has a great selection of extras onboard including an 18ft Castoldi Jet Tender, Water Skis, Wakeboard and various inflatable’s. 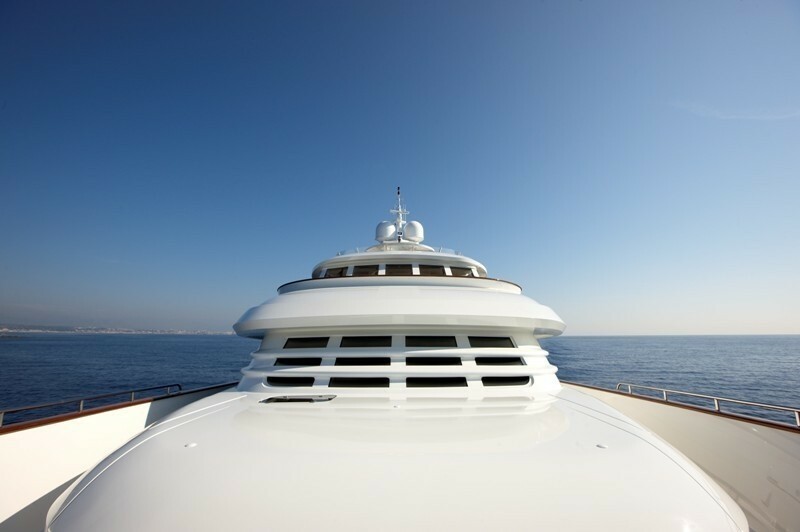 Communications include VSat, IP telephony, Internet from all cabins, Iridium Satellite phone, GSM, Audio Visual Equipment and Deck Facilities include Kaleidescape HD system throughout - 650+ movies, UK Sky HD and local Satellite TV and radio services, Dedicated PC in each cabin with DVD player, Creston controllers, HD and SD, Navigation camera and thermal and light intensifying cameras. 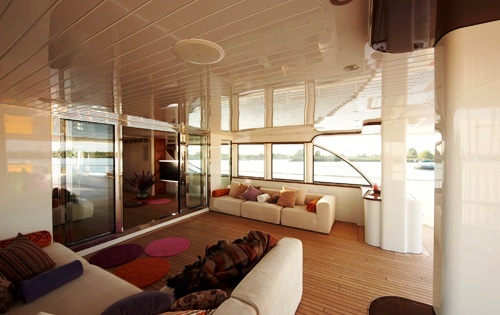 Sky lounge (behind wheelhouse): TV and Xbox. 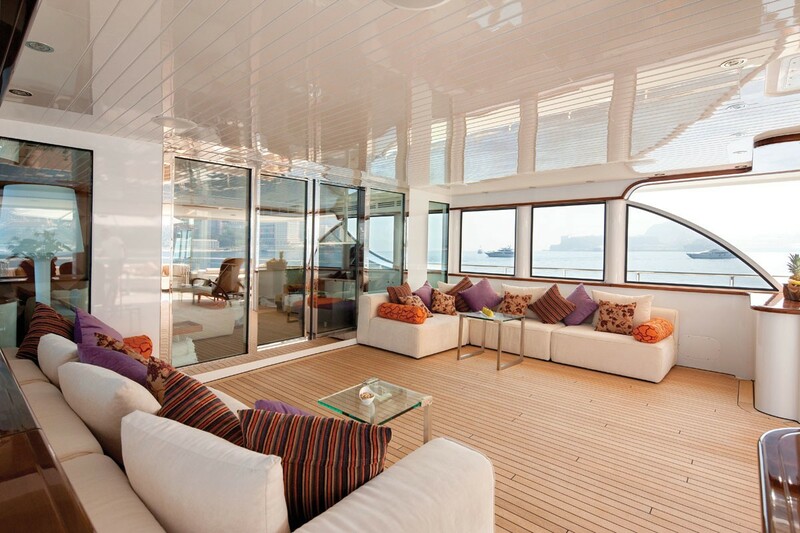 Deck: Indoor outdoor living between lounge and after deck.